I am married to a girl in the UK. We are now planing to apply for a spousal visa. I was refused under 320 7(a) in 2009 due to false bank statement submission. Will this automatic ban period affect this new visa application as it is a spousal visa and I was refused a student visa? Please help me find a way out if any. You were refused under 320 (7A) for providing a false document (bank statement) and, for that reason, under 245ZV(c), that you did not have sufficient funds to be a genuine student. A320. 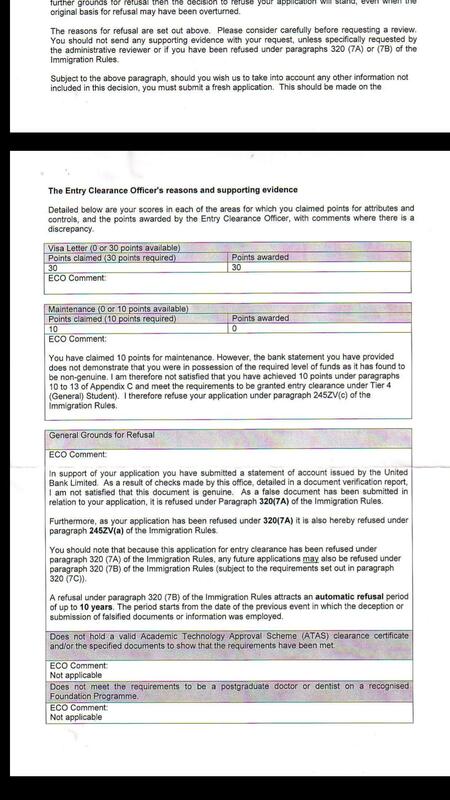 Paragraphs 320 (except subparagraph (3), (10) and (11)) and 322 do not apply to an application for entry clearance, leave to enter or leave to remain as a Family Member under Appendix FM, and Part 9 (except for paragraph 322(1)) does not apply to an application for leave to remain on the grounds of private life under paragraphs 276ADE-276DH. Should you need guidance, you might want input from an immigration advisor, which you can find through the Immigration Law Practitioners' Association. Not the answer you're looking for? Browse other questions tagged visas uk spouses or ask your own question.